Gringo review: "Doesn't linger, but you’ll enjoy it while it lasts"
A fun romp with a great comic performance from Oyelowo. Doesn’t linger, but you’ll enjoy it while it lasts. Over the past few years, Nash Edgerton has bounced – possibly literally – between being a top-notch stuntman (on movies such as The Matrix and Superman Returns) and a blossoming career as a director. After a stack of shorts and a 2008 feature The Square co-written with his more famous sibling Joel, he now steps things up with Gringo, a comedy-thriller with enough energy to power the National Grid. With Joel on hand as one of the co-leads – alongside Charlize Theron and David Oyelowo – it’s a south-of-the-border caper seasoned with blood, guns and medical marijuana. 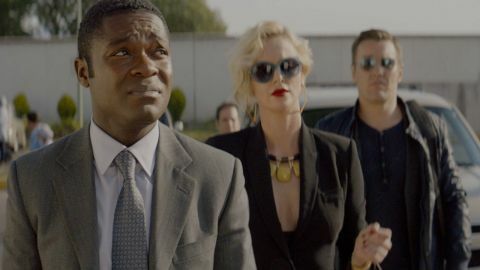 As the film opens, crooked business partners Richard (Edgerton) and Elaine (Theron) – post-boardroom bonk – get a call from their mild-mannered accountant Harold (Oyelowo), screaming that he’s been kidnapped in Mexico. That’s just the start – or rather the mid-point – of a twisty amoral adventure where no one is to be trusted and most are to be feared. Flashing back, the film fleshes things out. In the process of ditching their Chicago pharmaceutical firm to a conglomerate, Richard and Elaine are looking to cut ties with one of their more shady partners in the business of manufacturing medical marijuana – a ruthless Mexican kingpin. Harold, the only good guy amid a scorpion’s nest of scumbags (even his wife – played by Thandie Newton – is doing the dirty on him), soon gets wind that he’s going to be out of a job. And when he realises that his employers couldn’t care less, he sets out to turn the tables. But little is straightforward in a dense plot that also ropes in Amanda Seyfried and Harry Treadaway as tourists and Sharlto Copley as a mercenary with a conscience. Double-crosses, cases of mistaken identity... just keeping up with it all leaves you out of puff. Sadly, some of it feels derivative. Written by Matthew Stone (Intolerable Cruelty) and Anthony Tambakis (Warrior), the script’s guilty of lapsing into sub-Tarantino moments – not least when it comes to the aforementioned drug lord, who likes nothing better than pop-quizzing his potential victims about whether they think Sgt. Pepper’s Lonely Hearts Club Band is indeed The Beatles’ best album. Performances vary: Theron’s foul-mouthed act wears thin, Edgerton passes you by, but Copley is a live wire. At its heart, however, is a fine turn from Oyelowo. The Selma star isn’t known for his comic chops, but he’s both funny and touching as the hapless Harold, a man you want to root for. While it’s a pity talents like Seyfried and Treadaway are superfluous amid a chaotic final act, at least Edgerton (Nash, that is) keeps the fun flowing. A movie that’s easy to like, despite being easy to forget.